Thanksgiving Holiday is getting closer. This is one of our favorite Holidays. This is the season we focus on giving thanks to the Lord for all the blessings. There are many ways we can express our gratitude to others. One way I love is by sending them handmade cards. You pour your love into the cards you make for them and they will appreciate every moment you spend to make it for them. Today I am sharing some the cards I made as part of the Joyful Stars Blog Hop this month. If you arrived from Marie’s blog then you are on the right track 🙂 The blog hop starts at Joyce’s blog where you can find the whole list of participants. All cards I made are using the new stamp set, Harvest Wreath (D1662). This one stamp set has lots of beautiful images you can use for Fall theme projects. The first card, I stamped the wreath straight on the White Daisy card base and added the stamped embellishment, sequins and sparkle clear on it. The Non-stick Micro-tip Scissors is the best sciccors to fussy cut. Woodgrain Embossing Folder (Z1996) – you can use CTMH embossing folders with any kind of die cut machine like Cuttlebug, Evolution Advanced, Evolution, etc. 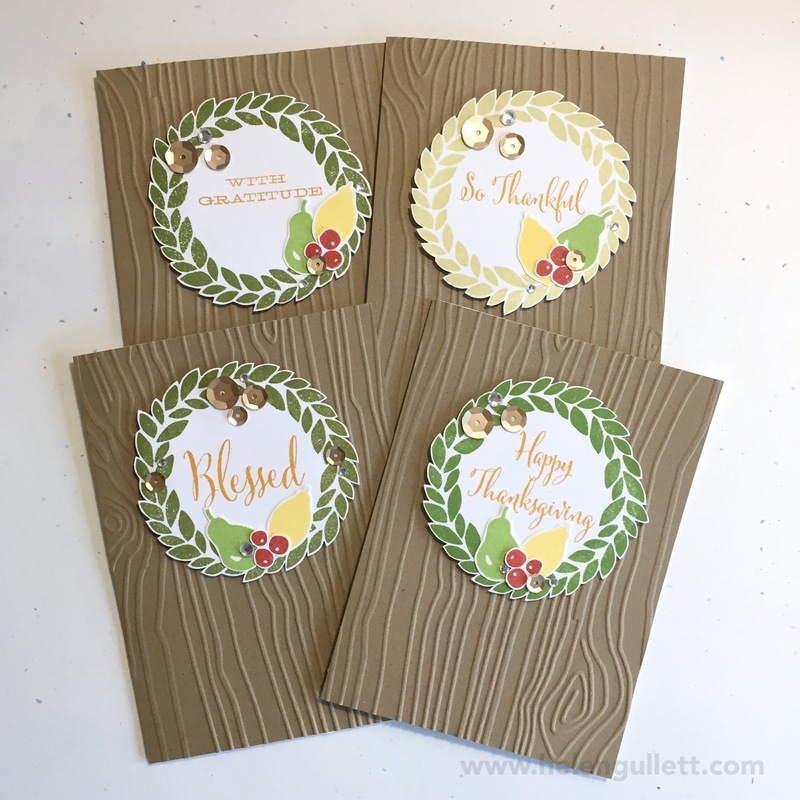 Exclusive Inks Stamp Pads: Goldrush, Flaxen, Canary, Cranberry, Pear, Olive (retired, new ink pad Fern is best for stamping the wreath and leaf. ), Black. All supplies are available at my CTMH store. Don’t forget to check the National Stamping Month stamp sets, Hello, Life! stamp sets and you do not wanna miss this gorgeous stamp set from the September Stamp Of The Month, Paper Garden. When you put an order, don’t forget to join my Online Gathering Party for a chance to win $10 Hostess Reward credit. Your next hop is Lori’s blog to see what she has created for you. I also link up my card at Susan’s Thanksgiving Crusade Thanksgiving Challenge 2015. Have a wonderful Wednesday & Thank You for stopping by! Welcome to Joyful Stars April Blog Hop. This is a monthly blog hop from a group of Close to My Heart Independent Consultants. If you arrive from Lori’s blog , then you are on the right track. If you happen to be here first, please keep on hopping to visit my fellow consultants’ projects. The hop starts at Joyce’s blog where you can find the full list of participants for this month. This time I made a note card featuring Smiles Begin With You Stamp Set, Blossom Paper Packet, Sequins Gold Assortment and Stitching Guide. Creating the chalkboard looking card is very easy. On a piece of Black cardstock, stamp the sentiment with VersaMark ink pad and heat embossed it with White Embossing Powder. Then, using a piece of paper towel or tissue, with circular motion add the White Daisy Pigment Ink all over the cardstock. And I usually dry the pigment ink using Craft Heater for quick drying, but you can let it sit on the side for air-drying if you are not in hurry. Then I add the banners I cut form Blossom Paper Packet and add at the corner of the card using adhesive runner. Using the Stitching Guide and Stitching mat + needle set (retired, but I recommend to get this Stitching Mat). I stitched them by hand. These Stitching Guide and Mat is very easy to use for card-making and scrapbook layouts. I finished my card with some Sequins Gold Assortment. I love all CTMH Sequins Assortment because they have adhesive already, just ready to use on projects. I hope you’ll like my project this month 🙂 Your next hop is Nickie’s blog to see what she has created for you this month. Thank you so much for hopping by at my blog! Don’t forget we have very DEAL OF THE DAY grab bag every day that you can SAVE lots of money on crafting supplies, it starts at 3 PM (Mountain time) for 24 hours, every day for the whole month of April. And this Stamp of the Month – Typed Note (S1504, set of 19) is a must to grab, too, for only $5 with $50 or more order! Today is day 5 of my post of Card Loving Cardmakers Spring Blog Hop. I have a giveaway, please read all the way to find out how to enter for chance to win. If you just arrive here today, don’t forget to check out Day 1, Day 2, Day 3, and Day 4 projects for chances to win the prize!! My card today is using the same way I created my card’s background like on the Day 3 except this one I did diagonally. The card based is White Daisy Cardstock, top folded. I cut 3″ x 4.25″ Smoothie cardstock that come’s with the Hotscotch Paper Packet and add it on the card using adhesive runner. And then I printed the digital stamp Love You More from Evelin T Designs on a piece of White Daisy Cardstock, then I picked the rainbow colors from Watercolor Pencils using aqua brush. I enlarged the image to fit for 3.25″ tall. I added the colored image on the card using 3D foam tape. I will be posting a card a day until Friday, March 6, 2014. To enter the giveaway is very easy, just leave a comment on every blog post about Coffee Loving Cardmakers Spring Blog Hop. You have until Sunday, March 8th at 11:59 PM EST. Please make sure you leave your email on the comment so I can contact you if you win. 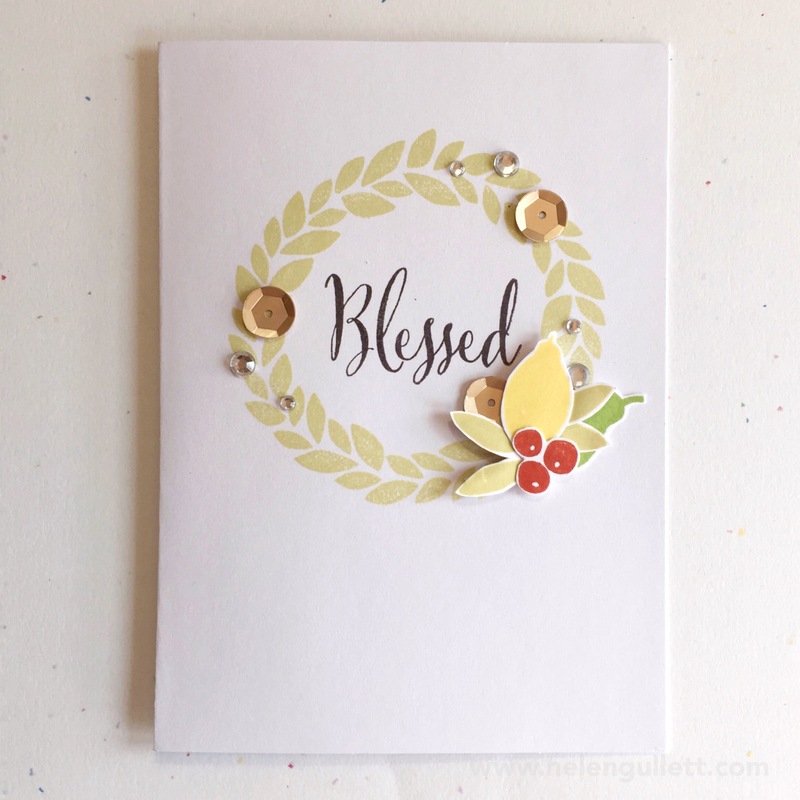 Today is day 4 of my post of Card Loving Cardmakers Spring Blog Hop. I have a giveaway, please read all the way to find out how to enter for chance to win. If you just arrive here today, don’t forget to check out Day 1, Day 2, and Day 3 projects for chances to win the prize!! I go with clean and simple today using Cup of Cheer Stamp Set and Hopscotch Paper Packet. Love the spring pattern and colors in this paper packet. Just simply add the pattern paper on the front panel of the card using adhesive runner. On a 1.25″ x 4.25″ strip of the pattern paper, I stamp the sentiment and coffee bean with Cocoa Ink Pad, and then add it on the card using adhesive runner. For the coffee cup, I stamp on another pattern paper using Cocoa Ink Pad, cut it using micro-tip scissors and add on the card using 3D foam tape for some dimension. Before I added the coffee cup, I stamped the steam first directly on the card.